For Project Online, both files were provided to you when you exported the user data through the procedures in Export user data from Project Online. For Project Server, you will need to save the specific project file to XML format to create the XML file. When saving a project file to XML format with Project Professional, make sure that you have applied the latest updates. Open the specific project's XML file in a text editor. In the text, search for <Views> to find a list of user views for the project. Now open the project's MPP file in the Project Online Desktop Client or Project Professional 2016. Click the View menu to open the ribbon, and in the ribbon select the ** Other View ** dropdown menu, and then click More Views. In the ** More Views ** window, in the Views list, select the view you are looking for, and then click Apply. The selected view will display. Take a screenshot of the view and save it. Use the same procedure for all remaining custom views you found in the XML file. You can repeat this procedure on each project in which you want to search for your user's customized views. In the text, search for <Filters> to find a list of user filters for the project. 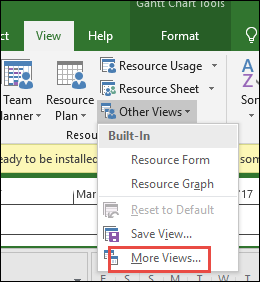 To save the view, open the project's MPP file in the Project Online Desktop Client or Project Professional 2016. Click the View menu, and in the ** Filters ** dropdown menu, select More Filters. In the ** More Filters ** menu, select the filter you are looking for, and then click ** Edit **. The filter definition for the selected filter will display. You can take a screenshot of the filter definition and save it. 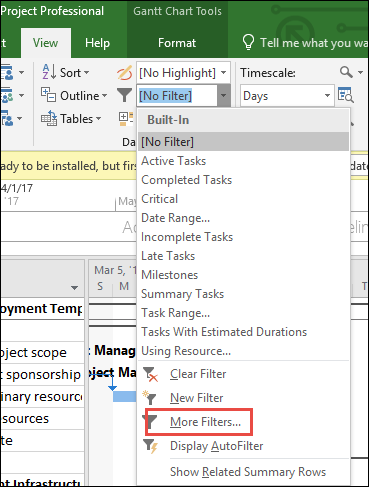 Use the same procedure for all remaining custom filters you found in the XML file. You can repeat this procedure on each project in which you want to search for your user's customize filters. In the text, search for <Tasks> to find a list of user tasks for the project. To save the attachment, open the project's MPP file in the Project Online Desktop Client or Project Professional 2016. Click the Tasks menu, and open the task associated with the attachment (for example, task #18). In the Task Information screen, select the Notes tab. You should see the attachment item listed. Open the attachment item and save it. Use the same procedure for all remaining attachments you found in the XML file. You can repeat this procedure on each project in which you want to search for your user's attachments. In the text, search for <Tables> to find the tables in the project. 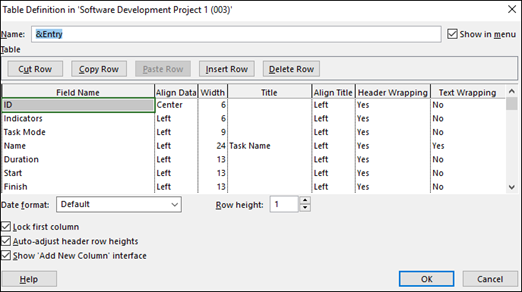 Click the View menu to open the ribbon, and in the ribbon select the Tables dropdown menu, and then click More Tables. In the ** More Tables ** window, in the Tables list, select the table you are looking for, and then click Edit. The Table definition will display for the selected table. Take a screenshot of all the information in the definition window and save it. Use the same procedure for all remaining customized tables you found in the XML file. You can repeat this procedure on each project in which you want to search for your user's customized tables. A project's XML files will not flag if it contains VBA macros. You will need to manually open the user's projects to verify if it contains a VBA macro. Open the project's MPP file in the Project Online Desktop Client or Project Professional 2016. Click the View menu to open the ribbon, and in the ribbon select the Macros dropdown menu, and then click View Macros. On the Macros page, select Visual Basic to open the Visual Basic Editor. In the Visual Basic editor, you can save each of the users custom VBA files. You can repeat this procedure on each project in which you want to search for your user's customize macros.